Great dealership! They go out of their way to find you exactly what you want. On top of that they are incredibly transparent with their pricing and they will take the time to explain the terms to you. They are a rare find in the car dealership world, if you don't believe me then go and find out for yourself. You won't be dissapointed! Had a very positive experience (5 of 5) on our recent new car purchase. The Right Honda sales representative (Sam Borden) was very personable and immediately responded to our description for a new car model. Sam was very knowledgeable on the specifics of the model we were interested in and also of other comparable manufacturers' makes and models. He was understanding of our budget and we never felt uncomfortable in being up-sold or pressured into a selection that didn't satisfy our initial visit parameters. 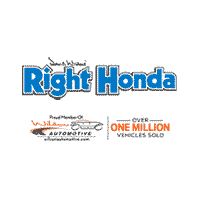 The Right Honda administrative credit review and financing paperwork process was also smooth and we appreciated the lack of up-selling of the various options. The options were explained, any and all costs were noted, we made our decisions and then were allowed to move on without any more fuss. Car purchases 'horror' stories are readily known which made this stress-less new car purchasing experience appreciated. Very cool group of people, who will work with you to get you into a new car, with a good rate. Very nice people, very nice cars, 10/10 would recommend. My first car was a Honda that I kept for 17 years I just traded that in for a new one on my birthday April 11. I will always stick with a Honda. Extremely kind and helpful in finding the perfect car and financing for your needs! Ask for Vic and Jeremy!